Our local Marina. All of our fishing trips depart from here. 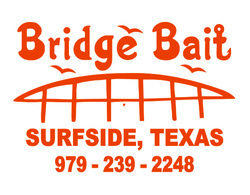 They offer the best in live and dead Bait , fishing supplies and a newly renovated boat ramp. swing by for all you local fishing needs , or for the local atmosphere and the occasional live music. Texas' Only 100% Saltwater Fishing Magazine and your source for fishing the Gulf Coast. Captain Mike Jennings is a regular monthly contributor , check out his Articles in every issue. Ocean-Tamer Marine Grade Bean Bags are a product of Custom Marine Canvas, Inc. Since 1978 we have provided custom designed and manufactured highest-quality marine seating and upholstery products! This is my personal outboard and boat dealer. Don Busha is by far the best out there , his service department is top notch and his overall customer service is second to none, they specialise in Yamaha , Evinrude and Suzuki Outboards.